The FreedomSite Blog: Section 13 Repeal - What does it mean for Victims of Section 13? Section 13 Repeal - What does it mean for Victims of Section 13? NO new Section 13 cases, but for those currently caught by Section 13. It’s all out WAR! Last week, the Senate of Canada passed Bill C-304, which repealed Section 13 and 54 of the Canadian Human Rights Act. 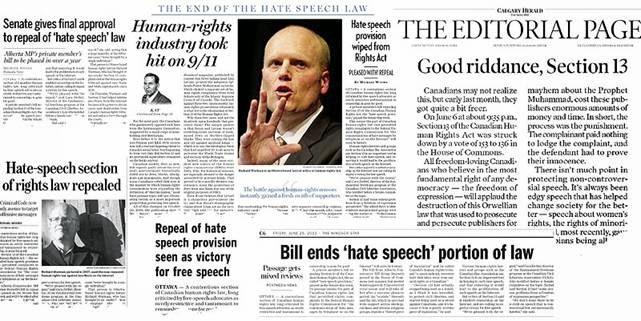 Section 13 was Canada’s shameful censorship legislation, which made it an offence to "likely" "expose" privileged groups to "hatred and/or contempt." There are NO defences under Section 13! Even truth and intent are considered irrelevant to a finding of discrimination. The law was enacted in 1977 and in the intervening years, not a single person who has been hauled up on Section 13 charges has ever been acquitted - a 100% conviction rate. Section 13 has been used and abused since its inception. Bill C-304 has a one year implementation period written into it, so in effect, Section 13 will technically be gone in June, 2014. It is unlikely that the Canadian Human Rights Commission will accept and approve any new Section 13 complaints at this point, but who knows, it’s really hard to know what fanatics will do. The CHRC’s main stumbling block is the Canadian Human Rights Tribunal which ruled in the Lemire case, that Section 13 was unconstitutional, and has since stopped all Section 13 cases “Sine Die”. It’s pretty clear the Tribunal does not want to be a willing participant in the Human Rights Commission’s fanatical restriction of freedom of speech, or have any part in the CHRC’s spying and harassing of Canadians. As odd as this may sound, in the judicial system, it was actually the Canadian Human Rights Tribunal which sounded the alarm over Section 13 and the CHRC’s apparatchiks’ handling of cases, and their steadfast refusal to mediate any complaints (which flies in the face of any remedial piece of legislation). Section 13 was never meant to punish and persecute people, but the fanatics at the CHRC just couldn’t resist grinding poor and defenseless people into the ground with protracted and expensive litigation. At it currently stands, there will most likely never be another new Section 13 case in Canada, but for those currently in the system; it’s a totally different story. Bloggers can now rest easy; that the “Nazi fetishists” of the CHRC will not be logging into their websites, dressing up as Nazis and spying on them. Message Board owners can breathe a little bit freer now and not have to worry about busy body “hate finder General’s” looking to cash in on the latest “witch”. The chill that Section 13 placed over all internet communications is now gone. But for those of us who are caught up in the Section 13 ‘torture rack’, it might still be a while until we can throw off the yoke of censorship. The process is still the punishment, and the CHRC is going to take out their anger and revenge on us. As of today, all other Section 13 cases have been stopped pending a decision in my case. But with being the last standing Section 13 victim, the CHRC is going to open up both barrels on me! Canadian law is quite a confusing thing. There is a big difference between a repeal of a law, and the court finding a law “unconstitutional”. Of course my entire 10 year legal ordeal against the CHRC has been for the latter. To find Section 13 of the Canadian Human Rights Act an unconstitutional abridgement of the Charter of Rights, and of my freedom of expression. I spent some 6+ years fighting for my freedom before the CHRC and the Human Rights Tribunal. On September 2, 2009, the Tribunal acquitted me of the hundreds of “hate speech” charges leveled against me, and also found that Section 13 was unconstitutional. This ruling was appealed by the CHRC to the Federal Court, which partly sided with the CHRC. The court ruled with me, that the fine provisions were unconstitutional (Section 54), but that Section 13 was just fine. That ruling is currently under appeal to the Federal Court of Appeals, with the Canadian Civil Liberties Association and others supporting my position. Just to give a better explanation between a repeal of a law, and the finding that a law is unconstitutional. (Keep in mind, I am not a lawyer) My impression is that the Parliament can repeal any law. That does not mean that the law was an unjustifiable infringement on any Canadians. But rather, when a law is found to be unconstitutional, it is the court saying that this law was wrong from the start, and is an unjustifiable infringement. The main difference is, when a law is repealed, no future cases can be brought. But if a law is found unconstitutional, then no cases should have EVER been brought. It may open up an option for individuals to sue the government for wrong doing, as well it demonstrates that no person should have even been convicted under the law. In effect, the law is flawed, and the court is correcting this flaw by striking down the law. Those are big differences, and especially important for those who are currently before the CHRC’s Section 13 Thought Inquisition. When a law is repealed, it applies going forward. But Canadian law is so screwy that anyone who was previously charged, they have to fight under the previously enforced rules. So basically, the law was “constitutional and in force” when the complaint was filed against me in 2003, so that’s the version of the law I am fighting. Move over ‘Alice in Wonderland’ there is a whole new world where the rabbit hole never ends. The heart of my appeal to the Federal Court of Appeals is that Section 13 is unconstitutional on dozens of grounds. That it is an unjustified limitation to the Charter of Rights and Freedoms, and not saved by Section 1 of the Charter. That’s really the crux of the case – Section 1 of the Charter. And as part of a review of my Section 1 arguments, the Court has to look at the will and wishes of the Parliament of Canada (pressing and substantial need). And this is where the repeal of Section 13 is going to immensely help me. How can anyone say that Section 13 is a minimal impairment to freedom and “pressing and substantial” in Canada, when the Parliament of Canada has spoken so clearly and repealed Section 13. 1. If Marc Lemire simply accepts the Federal Court ruling of Justice Richard Mosley then Lemire faces a lifetime Free Speech Ban for the “crime” of posting a document that contains the very same information and statistics the Canadian Blood Services used to ban homosexual men from giving blood. 2. Even if Section 13 is repealed by the Senate it makes no difference to Marc Lemire’s case, nor to the cases of hundreds of other Canadians already charged and convicted under this oppressive law. 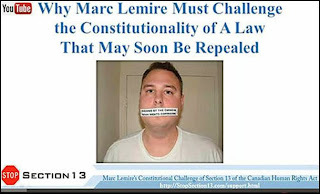 As absurd as it sounds, Marc Lemire could face a lifetime ban on his Right to Freedom of Speech under a law that no longer exists.Should he refuse to abide by the lifetime Free Speech ban he could go to prison. The maximum penalty for contempt of a Tribunal decision is 5 years in prison. The maximum penalty for a conviction of criminal “hate speech” under Section 319 of the Criminal Code: Two years. 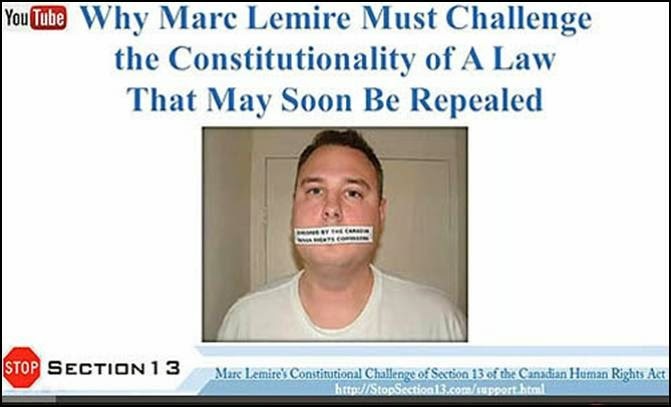 If Marc Lemire wants to retain his Right to Freedom of Speech and let me assure you, he does, then he has no choice but to challenge both the Constitutionality of Section 13 as well as appeal Justice Mosley’s horribly flawed and biased Federal Court decision. 3. It is critical for Freedom of Speech that Section 13 be denounced as an affront to our Charter Right to Freedom of Speech and that the Federal Court of Appeals strikes it down as unconstitutional. Why? It will mean the hundreds of cases prosecuted under this law over the past 33 years were unconstitutional prosecutions. More importantly, it will mean the penalties imposed by those unconstitutional convictions are also unconstitutional. 4. If Section 13 is declared unconstitutional, as any unbiased judge must clearly see, then those people suffering under lifetime Freedom of Speech bans could appeal to the court to have those bans removed. If the law is simply repealed (removed from the books) then there is no avenue in Canadian law for those individuals to regain their Right to Freedom of Speech. 5. There are multiple cases currently “on hold” because of Marc Lemire’s case, his Constitutional Challenge of Section 13 and his Federal Court Appeal of Justice Mosley’s decision. These cases are at both the Tribunal and Federal Court level. All of the cases currently “on hold” will move forward the second there is a final decision in Lemire’s case. 6. The Canadian Human Rights Tribunal, the body that said itself that Section 13 was unconstitutional, stopped all Section 13 cases pending the outcome of Marc Lemire’s case. 7. Repeal of the law does not address all corruption and the inappropriate administration of Section 13. We need a court to examine the spying, lying and conniving of the CHRC and rule that they were out of control in both Marc Lemire’s case and in many other cases. The stated aims of the Canadian Human Rights Act are remedial, not punitive. The object of the Act is to “correct discriminatory behaviour” not punish. Is it “remedial” to refuse any and all attempts at mediation? Is it “remedial” to refuse any and all attempts at mediation? Is it “remedial” to refuse to communicate with the subject of a Human Rights Act complaint? Is it “remedial” to continue prosecuting a man 8 years after all “offending” documents were removed from the Internet? Then please contribute generously to Marc Lemire’s Free Speech Legal Defense Fund so he can continue his appeal and Constitutional Challenge of Section 13 of the Canadian Human Rights Act. Now that Section 13 has been repealed by Parliament, the CHRC is going to go after me with both guns blazing. Can I count on you to support the cause of freedom? My courageous lawyer Barbara Kulaszka and I have demonstrated what two dedicated freedom fighters can accomplish against overwhelming odds. We have single-handedly and doggedly fought the system and exposed the corrupt underbelly of the "Human Rights" Commission's racket. I cannot carry on this important fight alone. Your donations literally equal the survival of this case.